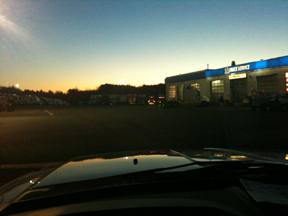 Dawn at the truck stop. We are less than three hours away from arriving at Ocala with the second and last group. We picked up Leif Z in North Carolina at 6:00 a.m. today, having finally made it to the border at 5:00 p.m. between the ice storm and the snow storm. We had a great drive down, hitting Washington at 1:00 a.m. is PERFECT!!! I will be happy to empty the three dogs and ourselves out of the truck and into the Florida sunshine in a few hours with no more trips until April.